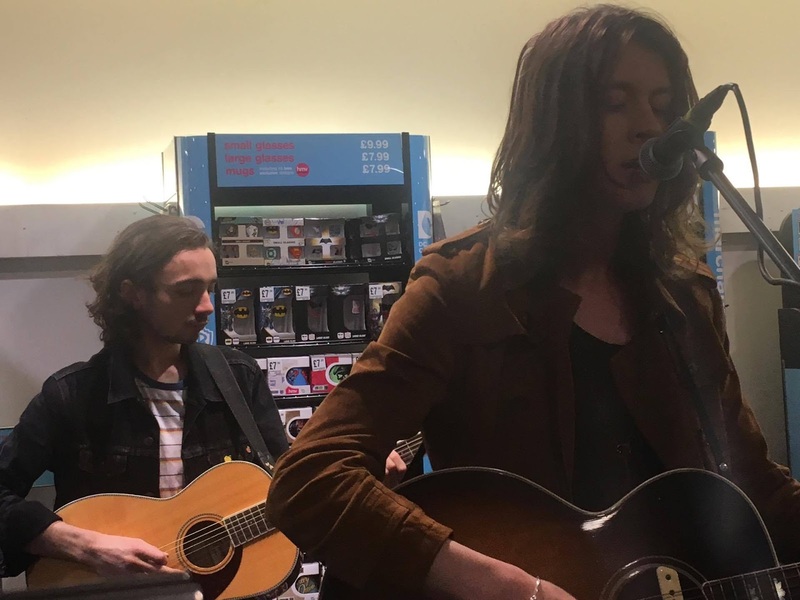 To celebrate the launch of their self-titled debut album Blossoms are embarking on a week-long tour of the nation's record stores to promote it and play a short acoustic set. We caught up on Day 1 in their hometown of Stockport, (not so) fresh from their launch show at the Plaza just hours earlier and later in the day in the Manchester Arndale store. After a show finishing after 1am and the subsequent celebrations, you'd be forgiven for letting Blossoms have a lie-in, but the schedule of the hardest working band (and crew) in Britain doesn't allow for such luxuries and so they make their way down to the Merseyway Shopping Centre's HMV store where they used to buy their CDs and DVDs as kids. The band are in good humour, laughing and joking as Myles searches in his bag for his shaker. They start with At Most A Kiss and it's testament to the enduring quality of the songs that none of the five that they play suffers from the translation to the stripped-down format. Whilst the album versions of the opener, Getaway, Honey Sweet, Blown Rose and Charlemagne are lavishly arranged and replete with pop hooks and melodies, the songs themselves stand up to the deconstruction of taking away the bank of keyboards and drums, the ultimate test of great songs. The band are on good form too. They laugh off the rudimentary audio set up freezing and drenching everything in tons of reverb on Honey Sweet and later Tom askes Myles whether Antz or Bugs Life is the best film. They spend an hour and a half signing CD, vinyl and posing for pictures with the several hundred people who'd turned out, providing inspiration to the kids of their home town that with application and, of course, the songs to go with it, you can make it. They've put Stockport firmly back on the map. Four hours later and less than ten miles away they take the stage upstairs in HMV's Manchester Arndale. There's a stage here where there was none in Stockport and the sound set up is superior, as you'd expect as the Manchester store run these type of events regularly. They play the same set as in Stockport although both the band and the overall sound are much fresher. There's a comedy moment when Tom asks who'd bought Myles a Bugs Life DVD. The girl in question is some way back and pushes through and hands the DVD to Tom exclaiming "Oh my God, it's Tom Ogden" as if you'd expect herds of wilderbeest sweeping majestically by rather than him at the front of a Blossoms gig. He thanks Martha who then asks how he knows her name. "You tweeted us" he replies to much laughter before adding "I'm not stalking you, or maybe I am." Despite the fame that's come their way in the past twelve months, it's refreshing to see it hasn't turned their heads as they're going to have to get used to it as the album gets to number one this week. 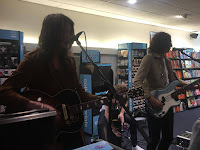 They then spend another couple of hours signing for the assembled fans before being whisked away to prepare for the following day's activities including Soccer AM and an appearance at Stockport County's Edgeley Park before Sunday's two shows at Gorilla and a week of more in-store shows. Today was about celebrating the release of the album and what better place to do it than their home town and the city down the road that have played such a role in their rise to where they are now. Our review of their Stockport Plaza show can be found here. Our review of the album can be found here.